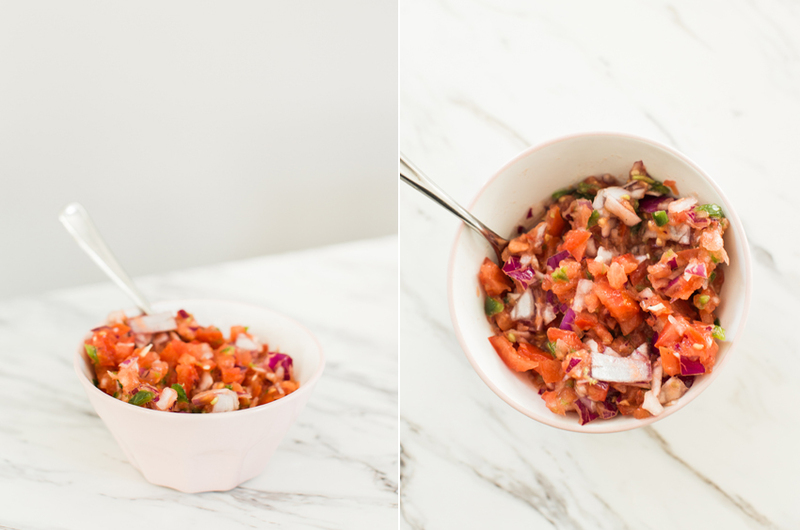 I promised I would share my pico de gallo recipe months ago on Instagram and wanted to deliver on my promise here with you today! I started making my own homemade pico last summer when I radically changed my diet and was in search for guilt free and delicious food. My go to breakfast dish is usually topped with a dollop of fresh pico and it’s really one of the highlights of my diet on any given day. We keep our stash in a mason jar throughout the week and usually use it for breakfast or nachos but this stuff is so good I am sure you could find so many other ways to enjoy it! It really doesn’t last long it’s that delicious. I use my food processor to blend everything but if you dice your ingredients up small enough you can probably get away without using one. 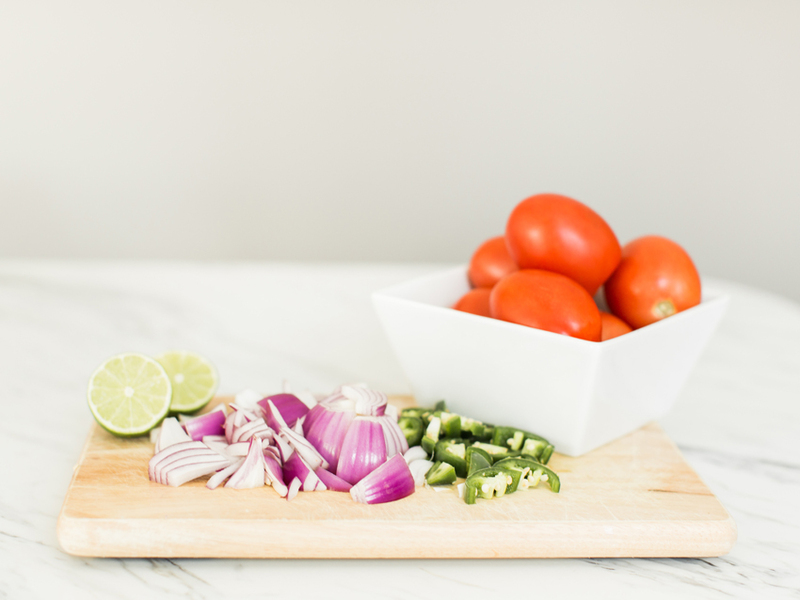 The more you ‘process’ everything the more salsa-like the consistency gets so start with bigger chunks of veggies if you’re looking for a thicker pico. I typically use the ‘pulse’ option on my food processor and pulse the ingredients only a handful of times before I get my favorite consistency. I also pour my pico through a fine mesh sieve before transferring to a jar. I don’t love having too much juice from the tomatoes in my pico and prefer it to be thicker and less ‘soupy’ but it’s entirely up to you! Also, if you’re a cilantro lover you should absolutely throw some fresh leaves in here for the perfect finishing touch. I absolutely hate cilantro (strong choice of words but I can’t stand the stuff) and can sense even a pinch of it in any given recipe. So it stays out of our house and out of this recipe. But I do know some people absolutely love the stuff so I wanted to mention it here because cilantro and pico go hand in hand for many. Finally, the salt and pepper is more so to taste so there isn’t an exact measurement given above. Actually, this recipe is a rough idea in general of how much to combine and usually makes about one medium sized mason jar of pico. If you wanted to make more or less you could play around with the amount of ingredients and have it tailored to suit your needs. Yummm! 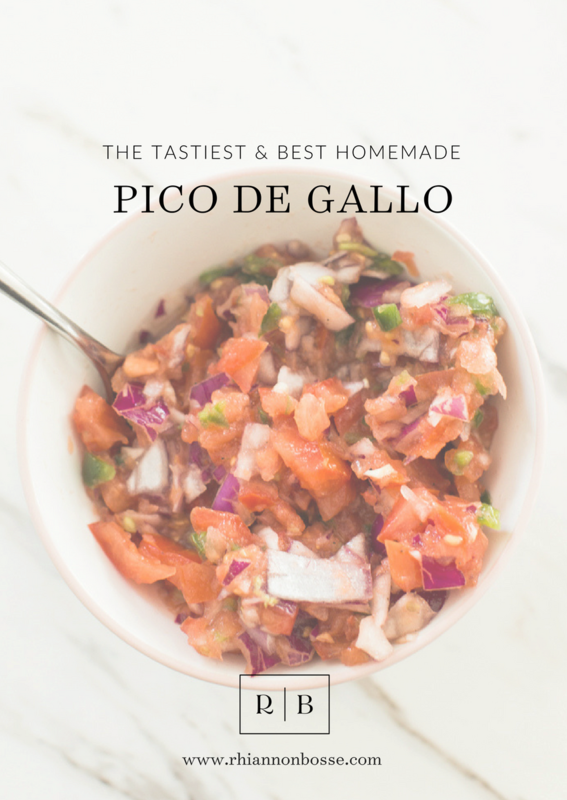 Like any good Texan, haha, I love pico de gallo, so I can’t wait to try this. And this is random, but I read once that liking/disliking cilantro is a genetic thing because some people register the taste as very soap-like. Is that what it tastes like to you?